30 cm 112 p. : ill. 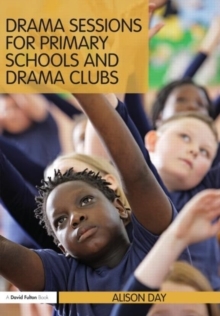 Drama Sessions for Primary Schools and Drama Clubs is an indispensable guide designed to help you run effective and enjoyable drama sessions in your primary school for a whole academic year. The author outlines thirty-three practical and user-friendly sessions, each one built around developing the social skills needed by children to become effective and positive communicators. Each session has guided time allocations and thorough explanations of what each exercise should achieve. The final session of the term culminates in a `show and tell' performance in which children can show their family and friends what they have learnt. As well as the sessions, this book also includes:Links to the national curriculum and SEAL;Notes on `performance';Health and safety;Extra sessions for use in smaller spaces;Explanations of the pedagogical benefits of every exercise. This unique and practical book will be of interest to all teachers who need to incorporate drama into everyday classroom learning as well as drama teachers and practitioners looking to run successful, interesting and fun drama sessions for their primary pupils.